This study aims to discuss the efficacy between Pulmonary Vein Antral Isolation (PVAI) plus High Density Left Atrial Voltage Mapping (HDVM) and pulmonary vein isolation on Paroxysmal Atrial Fibrillation (PAF). A total of 60 patients with paroxysmal atrial fibrillation underwent radioablation in our department from January 2012 to January 2014; all cases were divided into two groups: 30 patients in group A (PVAI), 30 patients in group B (PVAI+HDVM). Atrial arrthymic data including atrial premature, atrial tachycardia, atrial flutter, and atrial fibrillation were collected by routine Electrocardiogram (ECG) and 24 h-Holter every month during 1-year post-operation follow-ups. Ablation recurrence was defined as any atrial arrthymic events (atrial tachycardia, atrial flutter, atrial fibrillation) persisting for more than 30 seconds by real-time ECG record and/or 24 h-Holter 3-month after ablation. 60 cases of PVAI were operated successfully. Low-Voltage Zones (LVZs) were located on right superior pulmonary vein outside antrum in 7 cases, right inferior pulmonary vein outside in 3 cases, left anterosuperior wall in 6 cases, left anteroinferior wall in 9 cases, roof in 3 cases, upperposterior wall in 2 cases. 1-year atrial fibrillation ablation success rate were at the same level (83.3% vs. 80.0%, P>0.05). No difference were found in 3-month atrial arrthymic recurrences between two groups statistically (43.1% vs. 40.7% at 1st month, 20.7% vs. 21.3% at 2nd month, 21.3% vs. 20.2% at 3rd month, P>0.05). Combination of pulmonary vein isolation with high density left atrial voltage mapping cannot improve ablation success rate of paroxysmal atrial fibrillation and increase the recurrence of atrial arrthymias. Catheter ablation has become a well-established strategy in patients with symptomatic Atrial Fibrillation (AF), which could acquire better outcomes than oral anti-arrhythmic drugs both in paroxysmal or non-paroxysmal atrial fibrillations [1-3]. Circumferential Pulmonary Vein Antral Isolation (PVAI) has become the mainstream strategy for paroxysmal AF, however the recurrence rate was nearly 15~40%. Left Atrium (LA) substrate was found playing a key role in the process of paroxysmal AF recently. Further research on PVAI+LA substrate modification such as complex fractionated atrial electrograms (CFAE)/line ablation failed to show any improvement of the success rate while inducing more Atrial Tachycardia (AT) attack. The objective of present study was to discuss the best ablation procedure for paroxysmal AF through comparing the efficacy of PVAI plus high density left atrial voltage mapping with PVAI only. The study enrolled 60 paroxysmal AF consecutively from January, 2012 to January, 2014. Inclusion criteria: age between 18 and 70 years; symptomatic paroxysmal AF with episodes lasting less than 7 days failed therapy with anti-arrhythmic drugs. Exclusion criteria: thrombocytopenia (platelet<80 × 109/L); contraindication to anti-coagulation drugs (warfarin/ heparin, etc. ); left atria diameter ≥ 55 mm, intra-cardiac thrombi documented by transesophageal echocardiography; severe heart diseases (moderate to severe mitral regurgitation/ severe valvular heart diseases/dilated cardiomyopathy/ hypertrophic cardiomyopathy); abnormal thyroid function; severe liver or renal dysfunction (glutamic pyruvic transaminase (AST) or glutamic oxaloacetic transaminase (ALT) more than 3 times of upper limits of normal, SCr>3.5 mg/dl or Ccr<30 ml/min); a history of surgery in the previous 3-months, and previous ablation procedures; pregnant women; expectation of life less than 12 months. This study was conducted in accordance with the declaration of Helsinki. This study was conducted with approval from the Ethics Committee of Shaoxing People’s Hospital. Written informed consent was obtained from all participants. 60 patients were randomized to the PVAI (n=30) and PVAI +high density left atrial voltage mapping (HDVM, n=30). All patients stopped oral-anticoagualtion drugs and were given Low Molecular Weight Heparin (LMWH) 3 days pre-ablation. All procedures were performed after overnight fasting and under conscious sedation with the administration of intravenous fentanyl. PVAI was performed aiming at electrically isolation all pulmonary veins according to the following standard criteria: A 6 Fr decapolar catherer (Inquiry TM, St. Jude Medical, USA) was inserted into the Coronary Sinus (CS) via the left subclavian vein. A 6 Fr quadripolar catheter (Supreme TM, St. Jude Medical, USA) was positioned in the right ventricle via the right femoral vein. Two 8 Fr 65 cm long sheath (Swartze, SL1, St. Jude Medical, USA) were advanced to the left atrium through standard transseptal punctures. After the transseptal punctures, intravenous heparin was administered to maintain an activated clotting time of 250-300 seconds. Angiogram of PV and LA were then performed in the left anterior projection 45° and the right anterior projection 30°. A deflectable quadripolar open irrigated catheter (Thermo-cool, Biosense Webster, St. Jude Medical, USA) was inserted into the LA for mapping and ablation. Intra-cardiac electrograms were recorded using a digital electrophysiological recording system (Prucka CariodLab, General Electric Health Care System Inc., USA). After catheter placement, 3D anatomical shell of the LA and PV were constructed using the circular mapping system (Ensite-Velocity, St. Jude Medical). PV ostia were tadded on the map as guided by the angiography. Irrigated radiofrequency energy with a flow rate of 17-30 ml/min was delivered at the targeting ablation sites. The maximum temperature was set to 43°C and the maximum power was 35W. The circular mapping cathter was positioned sequentially within each of the PV antra as guided by the 3D electroanatomical map and angiogram to record PV potential. Circumferential radiofrequency applications were then delivered outside the PV ostia to electrically isolate PV from the LA. The endpoint of PVAI isolation was the complete disappearance of PV potentials or dissociated PV potentials with LA electrograms. PVAI was performed using the wide circumferential PV antrum isolation approach as described previously. Then HDVM was performed in sinus rhythm, if the patient was still in atrial fibrillation post-ablation then they received electrocardioversion. At least 300 points were acquired through circumferential PV mapping catheter (Inquiry TM AFocusII TM 10-pole high-density double-loop mapping catheter, St. Jude Medical, USA, inter-electrode distance 3.5 mm-3.5 mm-3.5 mm) for high density left atrial voltage mapping (Figure 1). Voltages were color coded according to corresponding color bars: scars tissue was delineated based on bipolar cut-off value of ≤ 0.1 mV (gray areas); Low Voltage Zone (LVZ) was 0.1-0.4 mV; Transitional Zone (TZ) was 0.4-1.3 mV; normal tissue was>1.3 mV (purple areas). Line ablation was performed surrounding the LVZs. Success was defined by: establishment of the voltage of LVZs ≤0.1 mV, complicated electrograms disappear or<0.1 mV. Complicated electrograms were defined as more than 3 deflections or width ≥ 50 ms. 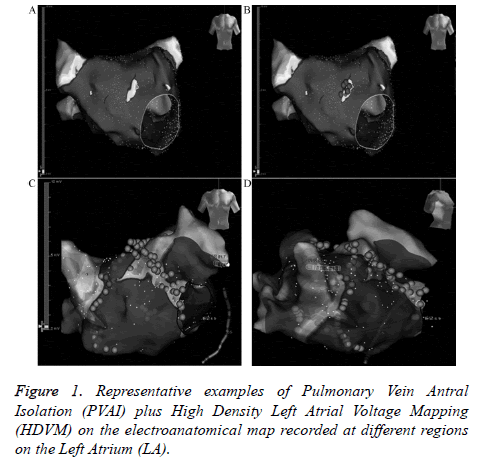 Figure 1: Representative examples of Pulmonary Vein Antral Isolation (PVAI) plus High Density Left Atrial Voltage Mapping (HDVM) on the electroanatomical map recorded at different regions on the Left Atrium (LA). Post-procedure, all patients received subcutaneous injection of low-molecular weight heparin for 3 days and continued anticoagulation with warfarin for at least 3-months. All patients were treated with oral anti-arrhythmic drugs (amiodarone/propafenone, and other class III or class Ic antiarrhythmic drugs) and received the 30 seconds real-time ECG record every month for 3-months after ablation. 24 h Holter recordings were performed during next 9 months. Atrial arrhythmic data including atrial premature, atrial tachycardia, atrial flutter, atrial fibrillation were collected by routine Electrocardiogram (ECG) and/or 24 h-Holter. Ablation recurrence was defined as any atrial arrhythmic events (atrial tachycardia, atrial flutter, atrial fibrillation) persisting for more than 30 seconds by ECG and/or 24 h-Holter 3-months after ablation. Any non-lasting atrial arrhythmias during 3-months follow-up were given observation or metoprotol; electro-cardioversion was given if atrial arrthymias last more than a week. Continuous variables are expressed as mean ± SD. Baseline and procedure variables were compared using t-test or Chisquare test. Statistical significance was defined as P<0.05. A total of 60 patients were enrolled into this study, and randomized to PVAI ablation (group A, n=30) and PVAI +HDVM (group B, n=30). The mean age was 55.3 ± 10.5 in group A and 53.6 ± 10.9 in group B (Table 1). All 60 patients received ablation successfully. No major adverse events were observed post-procedure, 2 femoral vein hematoma and 1 femoral arteriovenous fistula were cured after conservative therapy. Note: Basic characteristics were not statistically different between the two groups. AF: Atrial Fibrillation; LA: Left Atrium; EF: Ejection Fraction; BMI: Body Mass Index. Table 1. Baseline characteristics of the patients. In the PVAI+HDVM, LVZs located on right superior pulmonary vein outside antrum in 7 cases, right inferior pulmonary vein outside in 3 cases, left anterosuperior wall in 6 cases, left anteroinferior wall in 9 cases, roof in 3 cases, upperposterior wall in 2 cases. 1-year atrial fibrillation ablation success rate were at the same level (83.3% vs. 80.0%, P>0.05, Table 2). Note: 1-year atrial fibrillation ablation success rate were at the same level (P>0.05). Table 2. 1 year atrial fibrillation ablation success rate. No difference were found in 3-month atrial arrthymic recurrences between two groups statistically (43.1% vs. 40.7% at 1st month, 20.7% vs. 21.3% at 2nd month, 21.3% vs. 20.2% at 3rd month, P>0.05, Table 3) (Figure 2). 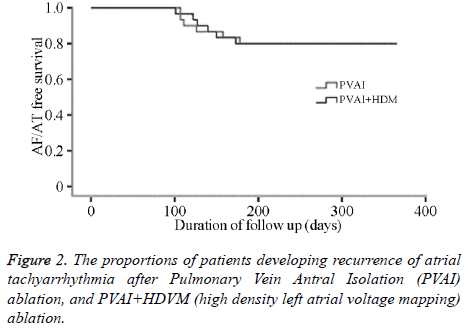 Figure 2: The proportions of patients developing recurrence of atrial tachyarrhythmia after Pulmonary Vein Antral Isolation (PVAI) ablation, and PVAI+HDVM (high density left atrial voltage mapping) ablation. Note: No difference were found in 3-month atrial arrthymic recurrences between two groups statistically (P>0.05). Table 3. Atrial arrthymic recurrences (%) during 3-months postablation. It is well known that PV ostia or the antrum area play an important role in the genesis of paroxysmal AF, and thus PV isolation has become the well-established treatment strategy in patients with paroxysmal AF. However, the success rate was just 60%~85% in the single procedure . LA substrate was found playing a key role in the process of paroxysmal AF converting to persistent AF recently. Further research on PVAI +LA substrate modification such as CFAE/line ablation failed to show any improvement of the success rate while inducing more AT attack. Recently most substrate modification in paroxysmal AF has focused on CFAEs ablation (complex fractionated atrial electrograms) [5-8]. This novel approach of AF ablation has been used as a stand-alone procedure or an adjunctive role to PV isolation for patients with paroxysmal AF. However, CFEs detection through visual inspection based on operator’s experience could be temporal and spatial instable, which limited its reference in substrate mapping [9,10]. Chen et al. enrolled 118 paroxysmal AF patients in a head-to-head study (60 received PVAI alone, another 58 received CFAEs alone) and set the mean follow-up time to 22.6 ± 6.4 months, a lower AF and atrial arrhythmias recurrence rate was observed in PVAI group . Li et al. analysed the results between PVAI and PVAI+CFAEs retrospectively, the two groups have the same ablation effects . Hayward et al. analysed the effects between PVAI and PVAI+CFAEs in 4-center research, found the same AF recurrence rate in two groups . There was no effect of additional CFAE ablation in patients with paroxysmal AF. Recent research on PVAI+LA linear ablation failed to show any improvement of the success rate either [14-17]. While in a study by Arbelo et al. , 120 drug-refractory paroxysmal AF randomized to receive PVAI alone and PVAI+LA line ablation with a 6 months follow-up showing that linear block at the LA roof is not associated with an improved clinical outcome compared with PV isolation alone. Sawhney et al. demonstrated a negative effect of additional LA line ablation in 16.4 ± 6.3-months follow-up . Gavin et al. using a new ablation strategy including PVAI+ablation on infero-posterior LA wall through CS, only 50% patients keep sinus rhythm comparing 77% success rate in PVAI group, with a higher mitral valve related AT attack rate . Voltage maps could be easily and accurately acquired through three-dimension system and voltage criteria has been well developed for substrate mapping. Chen et al. analysed atrial substrate characteristics using HDVM technique, found that LA average voltage was notable lower in persistent AF (vs. in paroxysmal AF) and in recurrence subgroup (vs. nonrecurrence group), thus LA voltage could be used for evaluating the ablation outcome. Kim’s study demonstrated some correlation between LA voltage and LA size, his further study found a large amount of LVZs lied in aorta and LA junction area, ablation across these LVZs to mitral valve could easily achieve bi-phase block while not rendering atrial arrhythmias . Hence, we can reach a conclusion that voltage mapping could be used as an assessment of LA substrate and a guiding tool for AF ablation. Presently there is little research focus on PVAI combining with substrate modification under HDVM. In this study, 60 paroxysmal AF were randomized to PVAI group and PVAI +HDVM group. In PVAI+HDVM group, LVZs located on right superior pulmonary vein outside antrum in 7 cases, right inferior pulmonary vein outside in 3 cases, left anterosuperior wall in 6 cases, left anteroinferior wall in 9 cases, roof in 3 cases, upper-posterior wall in 2 cases. No difference was found in 3-month atrial arrthymic recurrences between two groups statistically, and 1 year atrial fibrillation ablation success rate were at the same level. The main findings of the study showed that additional ablation guiding by HDVM did not increase the success rate of PVAI regarding freedom of atrial tachyarrhythmias 3-months after ablation. The overall number of patients who were enrolled in our study was relatively small and the follow-up period was not long enough. As a result, the present study was underpowered to determine the best ablation strategy for paroxysmal AF, which needs to be discussed further in future studies. This work was funded by Shaoxing Public Welfare Application Research Program (2014B70058). All authors have no conflict of interest regarding this paper. Turco P, De Simone A, La Rocca V, Iuliano A, Capuano V, Astarita C, Di Napoli T, Messina V, Baldi S, Stabile G. Antiarrhythmic drug therapy after radiofrequency catheter ablation in patients with atrial fibrillation. Pacing Clin Electrophysiol 2007; 30: S112-115. Wilber DJ, Pappone C, Neuzil P, De Paola A, Marchlinski F, Natale A, Macle L, Daoud EG, Calkins H, Hall B, Reddy V, Augello G, Reynolds MR, Vinekar C, Liu CY, Berry SM, Berry DA. Comparison of antiarrhythmic drug therapy and radiofrequency catheter ablation in patients with paroxysmal atrial fibrillation: a randomized controlled trial. JAMA 2010; 303: 333-340. Pappone C, Vicedomini G, Augello G, Manguso F, Saviano M, Baldi M, Petretta A, Giannelli L, Calovic Z, Guluta V, Tavazzi L, Santinelli V. Radiofrequency catheter ablation and antiarrhythmic drug therapy: a prospective, randomized, 4-yearfollow-up trial: the APAF study. Circ Arrhythm Electrophysiol 2011; 4: 808-814. Mainigi SK, Sauer WH, Cooper JM, Dixit S, Gerstenfeld EP, Callans DJ, Russo AM, Verdino RJ, Lin D, Zado ES, Marchlinski FE. Incidence and predictors of very late recurrence of atrial fibrillation after ablation. J Cardiovasc Electrophysiol 2007; 18: 69-74. Wong KC, Paisey JR, Sopher M, Balasubramaniam R, Jones M, Qureshi N, Hayes CR, Ginks MR, Rajappan K, Bashir Y, Betts TR. No benefit of complex fractionated atrial electrogramablation in addition to circumferential pulmonary vein ablation and linear ablation: benefit of complex ablation study. Circ Arrhythm Electrophysiol 2015; 8: 1316-1324. Providencia R, Lambiase PD, Srinivasan N, Ganesh Babu G, Bronis K, Ahsan S, Khan FZ, Chow AW, Rowland E, Lowe M, Segal OR. Is there still a role for complex fractionated atrial electrogram ablation in addition to pulmonary vein isolation in patients with paroxysmal and persistent atrial fibrillation? meta-analysis of 1415 patients. Circ Arrhythm Electrophysiol 2015; 8: 1017-1029. Scott PA, Silberbauer J, Murgatroyd FD. The impact of adjunctive complex fractionated atrial electrogram ablation and linear lesions on outcomes in persistent atrial fibrillation: a meta-analysis. Europace 2016; 18: 359-367. Nademanee K, Lockwood E, Oketani N, Gidney B. Catheter ablation of atrial fibrillation guided by complex fractionated atrial electrogram mapping of atrial fibrillation substrate. J Cardiol 2010; 55: 1-12. Roux JF, Gojraty S, Bala R, Liu CF, Hutchinson MD, Dixit S, Callans DJ, Marchlinski F, Gerstenfeld EP. Complex fractionated electrogram distribution and temporal stability in patients undergoing atrial fibrillation ablation. J Cardiovasc Electrophysiol 2008; 19: 815-820. Verma A, Lakkireddy D, Wulffhart Z, Pillarisetti J, Farina D, Beardsall M, Whaley B, Giewercer D, Tsang B, Khaykin Y. Relationship between Complex Fractionated Electrograms (CFE) and Dominantfrequency (DF) sites and prospective assessment of adding DF-guided ablation to pulmonary vein isolation in persistent atrial fibrillation (AF). J Cardiovasc Electrophysiol 2011; 22: 1309-1316. Chen M, Yang B, Chen H, Ju W, Zhang F, Tse HF, Cao K. Randomized comparison between pulmonary vein antral isolation versus complex fractionated electrogram ablation for paroxysmal atrial fibrillation. J Cardiovasc Electrophysiol 2011; 22: 973-981. Li WJ, Bai YY, Zhang HY, Tang RB, Miao CL, Sang CH, Yin XD, Dong JZ, Ma CS. Additional ablation of complex fractionated atrial electrograms after pulmonary vein isolation in patients with atrial fibrillation: a meta-analysis. Circ Arrhythm Electrophysiol 2011; 4: 143-148. Hayward RM, Upadhyay GA, Mela T, Ellinor PT, Barrett CD, Heist EK, Verma A, Choudhry NK, Singh JP. Pulmonary vein isolation with complex fractionated atrial electrogram ablation for paroxysmal and non-paroxysmal atrial fibrillation: a meta-analysis. Heart Rhythm 2011; 8: 994-1000. Pokushalov E, Romanov A, Katritsis DG, Artyomenko S, Shirokova N, Karaskov A, Mittal S, Steinberg JS. Ganglionated plexus ablation vs. linear ablation in patients undergoing pulmonary vein isolation for persistent/long-standing persistent atrial fibrillation: a randomized comparison. Heart Rhythm 2013; 10: 1280-1286. Arbelo E, Guiu E, Ramos P, Bisbal F, Borras R, Andreu D, Tolosana JM, Berruezo A, Brugada J, Mont L. Benefit of left atrial roof linear ablation in paroxysmal atrial fibrillation: a prospective, randomized study. J Am Heart Assoc 2014; 3: e000877. Zhang Z, Letsas KP, Zhang N, Efremidis M, Xu G. Linear ablation following pulmonary vein isolation in patients with atrial fibrillation: a meta-analysis. Pacing Clin Electrophysiol 2016; 39: 623-630. Hu X, Jiang J, Ma Y, Tang A. Is there still a role for additional linear ablation in addition to pulmonary vein isolation in patients with paroxysmal atrial fibrillation? An Updated Meta-analysis of randomized controlled trials. Int J Cardiol 2016; 209: 266-274. Sawhney N, Anousheh R, Chen W, Feld GK. Circumferential pulmonary vein ablation with additional linear ablation results in an increased incidence of left atrial flutter compared with segmental pulmonary vein isolation as an initial approach to ablation of paroxysmal atrial fibrillation. Circ Arrhythm Electrophysiol 2010; 3: 243-248. Gavin AR, Singleton CB, Bowyer J, McGavigan AD. Pulmonary venous isolation versus additional substrate modification as treatment for paroxysmal atrial fibrillation. J Interv Card Electrophysiol 2012; 33: 101-107. Pak HN, Oh YS, Lim HE, Kim YH, Hwang C. Comparison of voltage map-guided left atrial anterior wall ablation versus left lateral mitral isthmus ablation in patients with persistent atrial fibrillation. Heart Rhythm 2011; 8: 199-206.